Ruth Hussey is Dr. Hedy Fredericks. She’s not the first doctor in the family — ‘Doc’ Fredericks (Charlie Ruggles) is her uncle. Doc still works in Hedy’s small hometown, but Hedy is destined to be a big city girl. She’s on her way to Chicago when she stops to visit her uncle. On the way to her sleepy little town, Hedy meets three returning Marines, all sharing the last name Smith, who are also headed for Chicago. She takes them with her to visit Doc, thinking they’ll only stay for a day. A bit of conspiring leads Hedy to get stuck in town longer than she expected, with the possibility of finding love while she’s there. Bedside Manner is a pretty good wartime comedy. The script is fun, though a bit disjointed. The laughs are subtle but are definitely present, and they pick up as the film moves along. Hussey and her love interest, John Carroll, make an attractive pair. On top of that, they play well off of each other. Their singular performances aren’t particularly awe-inducing, but together the two are very charming. 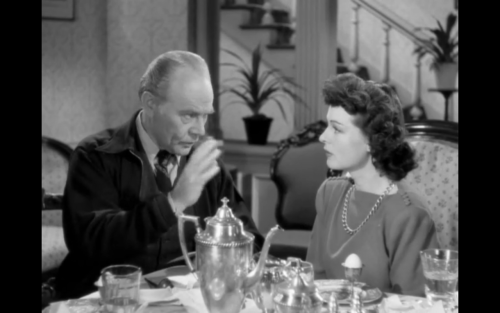 The best performance comes from doe-eyed Ann Rutherford as the jealous girlfriend of Carroll’s character. She delivers every line perfectly, and her character is hilarious. The three Smiths provide a lot of the comedic value as well. They’re only background characters, but they seem so lively and bright that they come close to stealing the film. This is a cute, fun film packed with pretty faces and quite a few little laughs. It doesn’t achieve quite enough comedic brilliance or provide enough laughs to get 4/5 or 5/5 from me, but it is delightful and worth a watch.